The City Council gives money to Veolia for bus driver’s raises, while refusing to restore promised Police Officer concessions. 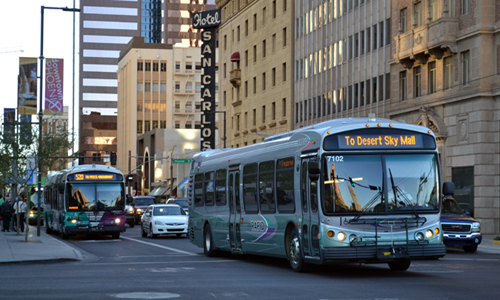 On Thursday, March 15th, 2012, the Phoenix City Council voted to relax standards for transit operator Veolia. The result is Veolia will pay over $1,000,000 a year less to the City of Phoenix. In addition, the City will also pay back over $700,000 to Veolia. This money was used by Veolia to settle this week’s bus strike and will result in Phoenix bus drivers getting a wage and benefit increase. Veolia bus drivers are already the highest paid in the valley. At the same time, Phoenix City Management is refusing to honor a contract with rank-and-file Police Officers, which calls for the restoration of 3.2% temporary concessions. In fact, City Management is demanding additional concessions on the backs of Phoenix Police Officers. Two years ago when the City was facing a $277 million dollar deficit, Phoenix Police Officers overwhelmingly approved the temporary concessions to help the city retain critical services that impacted the community. We lived up to our bargain, the city needs to live up to theirs! According to the recent City of Phoenix Compensation Study which the City paid $411,000 for, rank-and-file Phoenix Police Officers are paid at 98% of the market (below market). At the same time Phoenix Police supervisors and managers are paid at 105% – 111% of market. Phoenix firefighters of all ranks are paid 105% – 120% of their market. Police Officers at 98%; managers and firefighters 105-120% with the average being 110% of the market. Phoenix Police Officers deserve parity with the rest of public safety. Listen Now! to the related audio from the Mike Broomhead show on KFYI 550 AM.